Abridged version: It's Done(ish)! - Good. Plane. Living. As of the writing of this entry, my last update was posted in February 11th. I’ve been really focusing on getting the plane done, so over the past six months plus, building has taken a priority over updates. I’ve been diligent taking pictures and capturing the time-lapse videos, so in time they will get done… eventually! 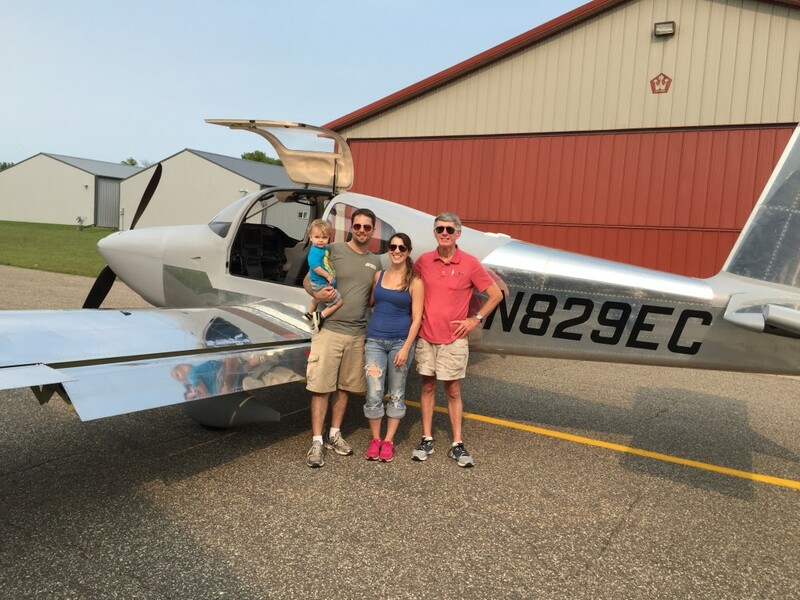 After the move to the airport right before Oshkosh, and a lot of time spent down at the hangar in a last push, the airplane was ready to fly on August 29th 2015. As you may have noticed, the plane’s registration number is N829EC. EC represents Ed and Colleen, and 829 stands for 8/29 which is our anniversary. And it is also now the date of of the first flight! Before we get to that, first the week leading up to the first flight… As you can imagine, quite a bit of time was spent finishing things up. Sunday, August 23rd, the FAA representative (called a DAR) came by to do the official FAA airworthiness inspection. Legally, this is the one that counts. With the STACK of paperwork all in order, and the plane assembled as much as it could be with all the inspection panels opened up, the DAR did his inspection and signed me off. At this point, I officially had a legal, airworthy airplane! However, since this FAA inspection was more a cursory look at the actual plane, and more focused on making sure all the boxes were checked, and t’s dotted and i’s crossed on the paper work, I wanted more tech experts to get eyes on the plane. On Wednesday, I had my tech councilor Gary stop down to give things a good look over to make sure everything was safe for flight. He uncovered a few small things that I was able to quickly resolve. I also contacted another tech councilor, Tom Berge, and the guy I choose to be the test pilot, Doug Weiler, to stop out Friday afternoon to get more eyes on everything. Their visits were also very good, as they both found a few more minor issues, and had some good suggestions on how to make some small changes that would help add more longevity to the plane. After the small punch list that we came up with was resolved, everyone was confident that the plane was airworthy! By about 3PM, Doug had arrived and the fog that had been lingering all morning lifted, and it was time! EJ is #2 for take-off behind the RV! 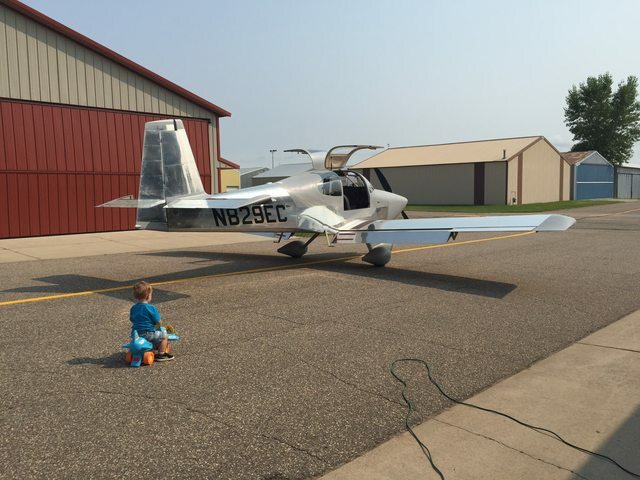 RV10 N829EC first took flight at 3:30PM on Saturday, August 29th, 2015. Doug took her up, and flew above the airport (for safety in the event of any engine issues) for about an hour. The engine is new and getting broken in, so Doug had to fly her at very high power, and was basically flying around in circles at about 200 miles per hour! No major issues were found, it flew well, the engine was smooth, and other than needing a bit of right rudder to stay straight (more on that later), everything was all good! Doug landed, taxied back to the hangar, and the first flight was over! It definitely didn’t sink in right away that “I built an airplane, and it flies!” For the first half hour of the flight, I was more focused on the reports that Doug was radioing back and watching the flight track on ADSB… then after everything was coming back good, I started to relax a bit and actually enjoy it! I don’t think it fully sank in until the next day! Sunday, we (Colleen, EJ, my parents, and I) did our annual trip to the state fair. I think it was a good thing to get away from the plane for a day to decompress a bit. I also think it was helpful to get out of the building mindset a bit and start transitioning into the flying mindset. Monday, after work, the weather was nice, so I drove down to the hangar. After a small adjustment to the nosewheel (this was what was making the plane need right rudder to stay in trim… all better now! ), I pulled the plane out and gave it a very good pre-flight inspection. Then I just sat in the plane for about 15 minutes going thru the entire flight in my head a few times… what switches needed to be flipped when, what frequencies I needed the radios tuned to, what power settings I’d be using, airspeeds and altitudes during different parts of the flight, and going thru the various checklists I have. After I felt sufficiently prepared, physically and emotionally, I closed the door, started the plane, taxied out, did my run-up tests, took the active runway, and took to the skies for the first time in MY AIRPLANE! It was pretty incredible. I didn’t know it at the time, but in reviewing the video from my first flight, it’s possible that I may have let out a “WOO HOO! about half way down the runway! The first flight was great! It took all of my mental bandwidth to keep up with what needed to be done to safely fly the plane, but the more I fly, the more the basics of flying an RV10 will become second nature. I’m also happy to report that of the three landings I made on that first flying day, they were all at least a solid “7” out of 10! So that’s my story. There is still a lot of work to do. Of the 40 hours of phase 1 test flying that are required, 2 are done! I still don’t have the rear passenger carpets installed, to leave easy access to the rear tunnel. Same goes for the rear lap belts. The plane is still obviously unpainted, and it will remain so until next April. As I’ve heard from many builders, homebuilt planes are never REALLY done, but for now, it’s done enough! Finally, I can’t end this without thanking my family, and specifically my wonderful wife Colleen. This truly wouldn’t have been possible without the support that she gave me from the very beginning. This really was a team effort, and even if she wasn’t in the garage helping every second, she was making sure that all of life’s other little (and big) tasks were getting done. Colleen, you really are the best! I can’t wait to take you flying! Maybe EJ can come with too… we’ll see! I feel like I’ve said Congratulations over and over again and so many times it seems insufficient. Many times I watched the videos and asked myself “how’s he going to do that” and then in the next video or series of videos you showed me “exactly how”. I’m sure that plane is as safe as any flying and I hope you continue to post your adventures. Looking forward to seeing the paint scheme and hoping you go wild on that….all the best to you and your family. Excellent! Congratulations on completing and flying, and that’s a very special airplane. I’ve checked into this blog several times to look ahead at what was coming up in my build and I’ve been impressed with your speed and attention to details, particularly the personal touches. oh the places we’ll go…. Wow, I’ve been following this for quite awhile trying to keep my motivation up until this winter when I start my RV-10. I have to say that the interior is exactly what I would want to do; I can’t find one detail that I would change, it is magnificent! I know you spent the last half of the year building and you have a lot of updating to do. Knowing that, are you planning to post what you used for the interior and avionics? Love the “Passenger Warning” placard! And thanks for the update! I’ve been following since the beginning and was starting to wonder what happened. Beautiful plane, I have enjoyed watching your build and all the information that you have shared. Who made your overhead edge lighted panel? Would like to use some on a RV 8. 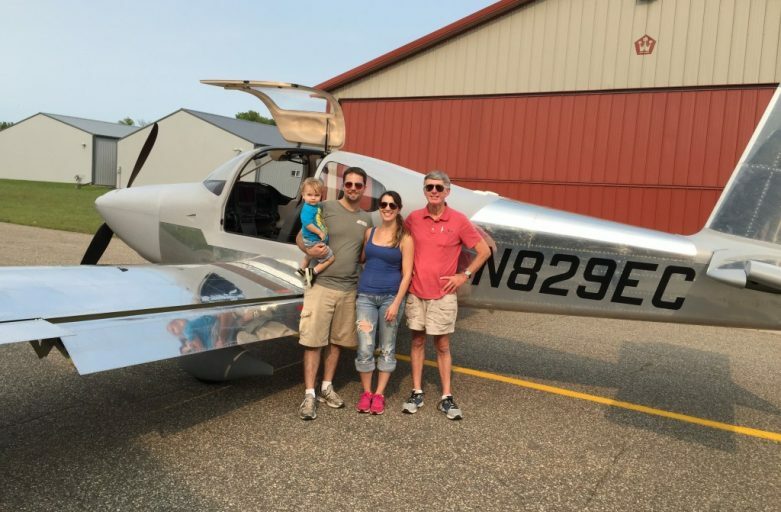 Ed and Colleen, I really appreciate your blog and all the work you put into the plane and documenting it. I was glad to see it win a Lindy at Oshkosh in 2016. I thought your cabin temperature control system was unique, but I haven’t found details on your blog that details the design and installation of the servos and the control system. If I’ve just overlooked it, please post a link.